Definition and description of the Trombone: The Trombone can be described as a brass instrument consisting of a long tube whose length can be varied by a U-shaped slide. A powerful brass instrument of the trumpet kind, thought to have evolved from the Sackbut, consisting of a tube in three parts, bent twice upon itself and ending in a bell. The middle part, bent double, slips into the outer parts, as in a telescope, so that by change of the vibrating length any tone within the compass of the instrument (which may be bass or tenor or alto or even, in rare instances, soprano) is commanded. It is the only member of the family of wind instruments whose scale, both diatonic and chromatic, is complete without the aid of keys or pistons, and which can slide from note to note as smoothly as the human voice or a violin. Softly blown, it has a rich and mellow sound, which becomes harsh and blatant when the tones are forced; used with discretion, its effect is often solemn and majestic. Family of Instruments: The Trombone belongs to the family of Woodwind instruments. 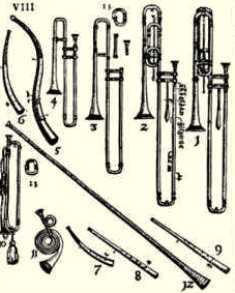 The earliest form of slide trumpet, which developed from the Sackbut instrument. Hans Neuschel of Nuremberg made great improvements in the construction of the trombone in 1498, a date which probably marks the final transition from sackbut to trombone, by enlarging the bore and turning the bell-joint round at right angles to the slide. 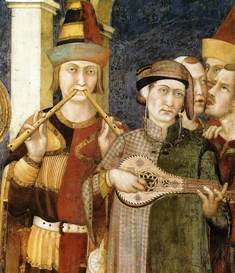 Medieval Musical instruments, including the Trombone, would be used by the musicians of the period including the Waits, Minstrels or Troubadours. There were three categories of musical instruments in the Middle Ages - wind, string and percussion. Terms of description were Bas instruments and Haut instruments. Bas referred to soft instruments (literally, "low," but referring to volume, not pitch) which were suitable for the chamber which included the vielle, rebec and other bowed strings, the lute and other plucked strings. Haut referred to loud instruments (literally "high" but referring to volume, not to pitch) which were suitable for outdoors which included the shawm, sackbut, pipe and tabor. Read the above history, facts and information about the Trombone. The Medieval Times website provides interesting facts, history and information about the musicians and styles of music which scatter the history books including Trombone. The Medieval Life and Times Sitemap provides full details of all of the information and facts about the fascinating subject of the lives of the people who lived during the historical period of the Middle Ages. The content of this article on Trombone provides free educational details, facts and information for reference and research for schools, colleges and homework for history courses and history coursework.